Can you get AIDS from bed bugs? Can you get aids from bed bugs? You’ll notice that when organizations talk about the transmission of disease from bed bugs, they are talking about the feeding process, specifically when the bed bug inserts its tubes into your skin to deliver anesthetic and drink your blood. Tests conducted do not show any evidence of HIV transmission from bed bugs or other blood sucking insects, however, viruses like West Nile, Yellow fever and Malaria can be transmitted by Mosquito and the same may hold true for bed bugs. Human blood burst onto hand from bed bug! The conclusion is that the blood from one human host is not injected into another human during feeding. However, a bedbug engorged with human blood can burst very easy as shown in this picture provided by a visitor that was simply checking for bugs and ended up with human blood on her hand! If you inspect a room with your bare hands, you may run the risk of being exposed to human blood as you accidentally pop the bugs. Depending on where the bed bug was located on you as you rolled over during sleep, you could crush and expose yourself to human blood. So, rather than ask the question “can you get aids from bed bugs”, I prefer to ask, “can you get aids from being exposed to infected blood from a bed bug”. It’s not the feeding process that I am concerned about, but rather exposure. 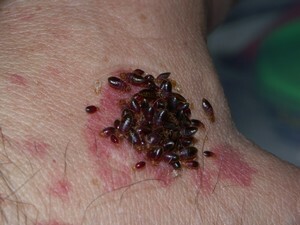 My advice – play it safe and wear gloves when checking for bed bugs. Number of rooms you see effected? Number of beds in the residence? When do you need completed? Note: We will need 4+ hours that the home will need to be vacated. Copyright © 2019 | Rock N Roll Pest Control. | All Rights Reserved.